I am a photographer, and I consider natural landscapes my most challenging subject. This is because I must capture both what is inside and outside of the frame by including just the right objects and presenting them in a meaningful way. When we examine risk matrices using the analogy of landscape photography, we see that they leave out too many important things (benefits, possibilities and uncertainty), do a poor job of providing understanding of the situation in context (sense making), and leave decision makers over-reliant on visual cues and visual motifs (spurious visuals). A better representation would put risk information in a context of relevant business data, provide visual cues for potential focus areas, and give better signals for decision making. Typically a risk matrix provides event, likelihood, and impact. Important information is missing but the typical risk matrix tricks the viewer into thinking it is all there. Sometimes businesses get caught up in visuals. Sometimes it is useful to drop back to the data to see what the visuals really speak to. Which risk should get the most attention and resources? How is this determined? What specifically is being asked and what information is available? Is this the same type of information found in a risk matrix used for business purposes? The narratives reveal what the risk matrix lacks: context. Needless to say, when presented in a risk matrix, death would likely get the most attention, discussion and debate. Any significant deflection of attention would need to be based on information outside the frame - and that's a poor informational and visual model. In essence, the viewer is fighting against the tool that is meant to assist in deciding where to put that attention. When that happens, something is wrong. A better representation would use a clustered stock chart in a format I call Benefit-Harm Pairing. Compared to the risk matrix, the Benefit-Harm Pairing shows us more aspects of risk and it better approximates a natural narrative style thinking. The pairing also provides action indicators which are more tailored to the risk than the risk matrix variety of "reduce likelihood." The chart below represents: activity, harm (expected, minimum, maximum), and benefit (expected, minimum, maximum). The sample Benefit-Harm Pairing presents a different picture of risk. Starting on the left with the treatment activity, the expected benefit is greater than the expected harm but there are also problems: high maximum harm and low minimum benefit. 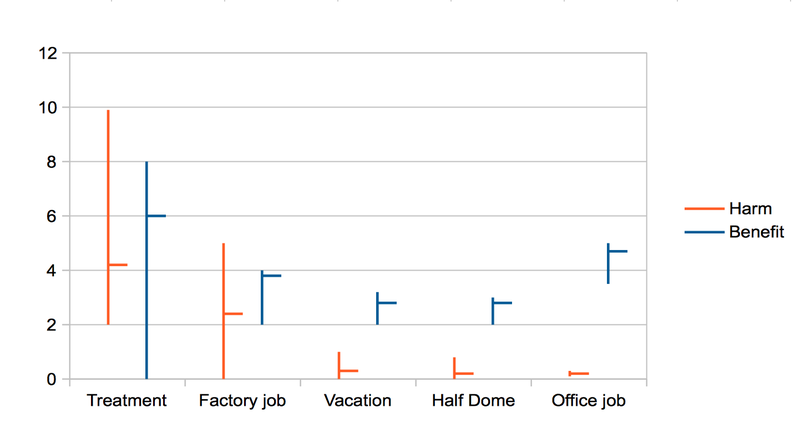 We have a similar Benefit-Risk Pairing shape with the factory worker. One of the indicated general approaches is to bring the minimum benefit up closer to potential harm. In practice, this could mean providing guaranteed lifetime benefits to compensate for work related injuries. The next three scenarios are different from the prior two but are similar to each other in basic shape. Picking the vacation example, the general approach indicated is to lower the maximum harm. A sample solution is splitting up the contents of the wallet into multiple pockets, and a hotel safe if possible. I suggest that while a risk matrix does give a view of risk, it isn't a particularly useful view of risk. Risk matrix conversations tend to focus around the correct values of specific likelihood and impacts, often as a proxy for benefits, desires, and other data outside the frame. People intuitively know important data isn't in the model. Benefit-Harm Pairing drives the conversation closer to the heart of the matter: are the benefits of this action worth the harms? Where could we focus resources and make adjustments to improve the relative benefit-harm outcomes? Should we abandon an activity? While Benefit-Harm Pairing has flaws, it seems to be more useful on the whole. In the words of George E. P. Box: "All models are wrong. Some are useful."